PFC Philip E. Wood, Jr.
Well–unbelievable as it sounds, three out of my ten weeks are now over, and let me tell you, the third was better than the second, thank God! In fact I have done quite well this week; haven’t been called down for anything, and no punishments. Been on time, neat, clean etc. I was really worried at the end of last week, but I feel good about it all now; and the worst of the nervous tension that was wearing me out–in fact, driving me wild–is now off. We’ve settled down to steady, awfully hard work; our platoon is doing better now, and the sarge has stopped riding riding us for the most part. My grades in the exams so far have been A, two B’s, and two C’s, which is somewhat better than average, but they don’t count as much as the Personal Characteristics grades made out by the sarge. We have been going awfully hard tho–six exams this week–the hardest this morning, with inspection right after it–last night was even busier than usual, if possible. 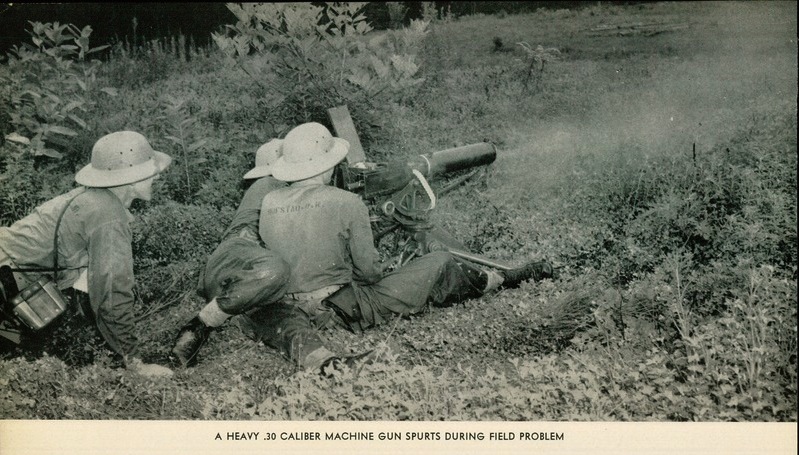 Lots of bayonet and drill–and some after supper early in the week–we have been throwing live hand grenades, going through tear gas attacks with and without masks–and boy that’s no fun! We go onto the rifle range week after next. It’s been good this week, thank God, but I’ve had a cold for most of it–and injections again just as I got over it. The second exam this morning on the functioning & parts of the machine gun was out of doors because there was so much equipment to identify. All very well, but it happened that it was pouring rain, and I was writing in ink. They told us to keep our papers under our ponchos–but you can’t write with the paper held under your fanny–tho I tried awfully hard, instinct tells you to do something else with it than write [on] it–and after twenty minutes felt like doing just that. I got so boiling mad and the stupid inflexibility of the army mind that I had to grit my teeth the whole time–ankle deep in mud–rain washing out every word as soon as you write it–making the paper so pulpy that the pen continually poked thru it; I saw two guys roll their papers up into a ball in disgust, and one poor lad in another company got a medicine-good case of hysterics, rolling in the mud and crying. We copied our answers over when we got back to the top deck, but most of the guys were completely illegible–worse than mine. Got two more grades, another A & C. Been relaxing this weekend, playing pool & ping pong. Aunt Kit sent a wonderful package to me; lots of candy and homemade cookies; thank them again for me Gretch when you go up. I’ve been a long time writing this–it’s Sunday and I just took a nap; gotta study now–but will write during the week this time. Phil is finally getting the hang of Candidates’ Class. Somewhat naturally, his performance in the classroom outstripped his military bearing, and his patience for “inflexibility” never fully developed. However, his transition to Marine is under way, as evidenced by the first sprinklings of Corps phrasing in this letter–using “lad” to refer to a subordinate, and “top deck” for the upper floor of his building. These qualities and traits, both good and bad, were noted by the eagle-eyed First Sergeant Thompson–hopefully Phil did not refer to “the army mind” when describing Marine training in his presence. Candidates of the 12th Reserve Officers’ Class–the next step after Candidates’ Class–fire a Browning M1917 at Quantico, 1942. USMC photo. An MG class at Quantico during Phil’s time there. Note rain cape on the instructor. USMC photo. There is a gap of about a month in Phil’s correspondence after this letter–if he made good on his promise to write more during the week, the letters have not survived. He left the rifle range qualified to wear the silver bar of Marksman, and eventually earned two additional weapons qualifications. Envelope postmarked August 10, 1942, making this date Saturday, August 8. Repetition of “riding” in original. Katherine Billings Wood, Phil’s aunt on his father’s side, married to Philip Wood Sr.’s brother Hamilton Wood. Ham and Kit lived in Massachusetts with daughters Katherine (“Kitsy”), Elizabeth (“Betsy”) and Frances (the webmaster’s grandmother).